A chainsaw case is very important because not only does it protect you and your chainsaw. It makes for you easy to carry the chainsaw and all the other tools you will require. However, many chainsaw owners often have a problem finding a chainsaw carrying case that fits. Most of the cases available in the stores are either too large or too small and just won’t fit. This is more likely to happen if the chainsaw was bought second-hand or from an auction, garage sale or the flea market. Sometimes you may have a chainsaw case but you would like one that can fit both your chainsaw and other tools that you will require when operating the chainsaw. The good news is that building a chainsaw carrying case is not too complicated. With only a few tools and materials, you can make your own handy fit-all chainsaw case from scratch and all in a few hours. Below are some instructions that you can use to make a simple wooden chainsaw case. Get the materials and tools you will need to make the case. Although you can use aluminum or polypropylene plastic, plywood would be a better choice because it is cheaper and also both light and durable. A chainsaw is already heavy and you will want to use a material that can hold that weight without being too heavy itself. You will also need two locking hasps, a handle and two or three sets of either piano or factory hinges. The hinges should be strong enough in order to hold the weight. All these materials can be found in your local hardware store or in a mail-order collection. Place your chainsaw on a flat surface and measure its height, length and width then write down the measurements. You can place it adjacent to a wall in order to measure its height. Ensure that you include the handle when measuring the height. Some chainsaws have longer spare bars than others and if this is the case, you will need to increase the length of your chainsaw case in order to accommodate it. Measure the location of the chain on the front of the chainsaw with the chain on a straight plane and record the measurements. For instance, the distance of the saw chain from one outer edge may be 4 inches and 3 inches from the opposite edge. You will need this in order to determine how far it will be from the sides and from the bottom of the chainsaw case. 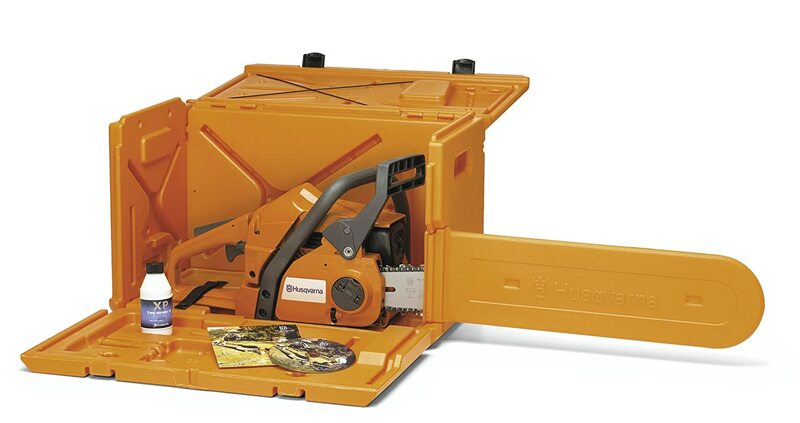 If you need a chainsaw case that will accommodate other tools that you will need to carry or to store together with your chainsaw, you can adjust the size of your chainsaw case as you wish. To determine the size of chainsaw case you need, lay out every tool that you usually require when operating your chainsaw. Purchase a plastic tool box that can accommodate all the tools and equipment you require. Measure the size of this tool box in order to determine what adjustments you will need to make in order to come up with a case that can accommodate both your chainsaw and the tool box. Put your plywood on a flat surface and draw rectangles of the spaces the chainsaw and the toolbox will occupy on it using a marker or a pencil. Cut out these rectangles following the drawn lines using a jigsaw and then cut out the hinge parts. Join all the corresponding parts together using nails and wood glue to ensure that your chainsaw is sturdy enough and able to carry both your chainsaw and the tool box. Use sand paper to smoothen all the edges both inside and outside of your chainsaw case. This finishing is optional but it will make your case smooth and more presentable. It is also important to attach four rubber feet at each corner on the bottom of the chainsaw case. You can put the handle on top of the chainsaw or on the side but it is important to ensure that the plywood is thick enough, the hinges and handle strong enough to be able to accommodate this weight. Ensure that you take safety measures at all times. Build your chainsaw in a place that is far from children and far from fire.